When you first get married you pledge your vows to your partner and as the years go on these vows can be tried and tested when you have to deal with various struggles together. 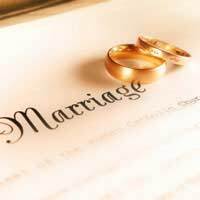 As you grow as a couple you may want to celebrate your commitment to each other and re-affirm those wedding vows you made years before. Think about the type of ceremony you would like and how much you can afford to spend. Then, decide whether you want to use traditional vows or personalise them to give them more meaning. There are a number of reasons why a couple may want to renew their wedding vows. Sometimes it is a romantic gesture at various junctures in your life or a regular commitment to remind you of the vows you made. Often though, it is a major event or experience that triggers it. Perhaps you have been together for a significant amount of time or have overcome major problems together and want to tell your partner how much they mean to you. It’s probably been a while since you planned your wedding so organising a ceremony may seem a little overwhelming. Try to remember that the event is about your and your partner renewing your vows together and not how fancy it all is. Think about what is important to you. Do you want it to be just the two of you or would you like to invite friends and family? Are your religious and want a church ceremony or would you rather escape to an exotic location? Once you start planning your renewal ceremony you will realise that the amount of money you could spend is endless. Be realistic about how much you can afford and set yourself a budget. Decide which aspects of the occasion are most important and cut back on elements that are not so important to you. If you don’t have much money to burn then think about getting friends and family to help out, holding the reception at your home, or making a dress, decorations or a cake yourself. The most important part of a vow renewal isn’t what you wear or where you hold it, but about what you say to each other. Decide together whether you want to stick with traditional vows or whether you want to write your own. Think about the times you have shared together, what you love most about your partner and how you have grown together as a couple. If you are struggling then look for inspiration on the Internet, in poetry books or ask family or friends to help you. Renewing your wedding vows with your partner is a great way to reaffirm your feelings and commitment to each other. Whether you want to hold a big ceremony with friends and family or run away together, make the day all about you two. Think about what you want and how much you can afford but ultimately concentrate on what you say to each other and the meaning and significance of your vows.